The silver center cent is an American pattern coin, a forerunner to the large cent and an early example of a bimetallic coin. Less than a dozen specimens are known to exist today. An uncirculated silver center cent was sold at an auction for $414,000 in January 2002. That coin should be worth more than one million dollars today. The silver center cent was an early attempt to reduce the size of the cent while maintaining its actual value. During the early years of the American republic, there was a general consensus that the intrinsic bullion value of the new nation’s coinage should be approximately equal to its face value. Some merchants would refuse to accept coins that did not meet this standard. For most denominations, bullion parity was achieved by producing the coins in a gold or silver alloy. However, the Coinage Act of 1792 specified that the cent was to consist of 11 pennyweight (264 grains) of pure copper. Such a weight, needed to maintain actual value, would have been too heavy for practical everyday use. 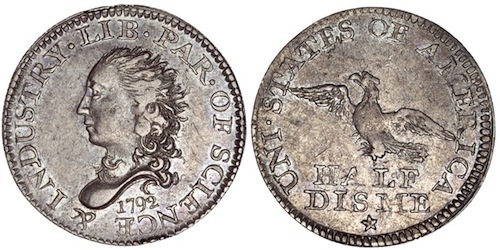 U.S. Secretary of State Thomas Jefferson suggested an alternative: the coin could be made of an alloy that was primarily copper, but which consisted of enough silver to generate an intrinsic value of one cent with a reasonable coin size. This bullion alloy was considered by the U.S. Mint, but U.S. Treasury Secretary Alexander Hamilton feared that it would be too susceptible to counterfeiting, since its appearance differed little from that of pure copper. In 1792, the Mint’s chief coiner, Henry Voight, hit upon a solution: a copper planchet, slightly smaller than that of a modern quarter, with a small silver “plug” inserted in a center hole during the striking process. The silver plug would have been worth approximately 3⁄4¢ at contemporary bullion prices, while the copper planchet added an additional 1⁄4¢ of intrinsic value. Several such coins were produced as test pieces. Ultimately, the additional labor required for these bimetallic coins proved unsuitable for mass production, and the large cent that was produced for circulation starting in 1793 consisted of 208 grains of 100% copper. The obverse of the silver center cent features a Liberty head with flowing hair. The date appears below the portrait, and the words “LIBERTY PARENT OF SCIENCE & INDUST.” are inscribed in a circular pattern around the central devices. The reverse design consists of a wreath with the words “ONE CENT” in the center, and the fraction “1/100” below. Surrounding the wreath, “UNITED STATES OF AMERICA” is inscribed. 1. ^ a b “J1/P1”. The Society of U.S. Pattern Collectors. http://www.uspatterns.com/j1p1.html. 2. ^ a b c d e Garrett, J. and Guth, R. (2003). 100 Greatest U.S. Coins. Atlanta, GA: H.E. Harris & Co. p. 48. ISBN 0-7948-1665-7. 5. ^ “The Coinage Act of April 2, 1792”. The United States Mint. United States Department of the Treasury. http://www.usmint.gov/historianscorner/index.cfm?action=docDetail&id=326. Retrieved 2010-04-16. 6. ^ The J2/P2 pattern has the same design as the silver center cent, but consists of a solid planchet with no silver plug. At least one specimen is made of a billon alloy — see here. 7. ^ “1792 Silver-Center Cent”. CoinFacts.com. Collectors Universe, Inc. 1999-2006. http://coinfacts.com/patterns/1792_patterns/1792_judd_01.htm. 8. ^ The silver center cent has a diameter of roughly 23mm, according to CoinFacts.com. The U.S. Mint’s specifications page on modern coinage lists the quarter’s diameter at 24.26mm. 9. ^ Julian, R.W. (2003). “The First Cent Coinage”. CollectorUSA. http://www.collectorusa.com/articles/1793.php.